KAMPALA– Buganda Road Magistrate court has granted bail to Makerere University Researcher Dr. Stellah Nyanzi after spending two days at Luzira prison. Nyanzi had appeared today in court to have her charges of harassment and offensive communication read to her and she pleaded not guilty. She informed Buganda Road Court Grade, one magistrate, Gladys Kamasanyu that as a poetess, she has been writing extensively about what she terms as an illegitimate regime of president M7 and she wonders why at this time the president claims to have taken offense when she writes about his late mother. After reading the charges relate to attacking the privacy of President M7 and his late mother Esteri Kokundeka, Nyanzi immediately informed court that she has no interest in being released on bail. She appeared before Buganda Road Court Grade one magistrate Gladys Kamasanyu whom she told that as a poetess, she has been writing extensively about what she terms as an illegitimate regime of president M7 and she wonders why at this time the president claims to have taken offense when she writes about his late mother. 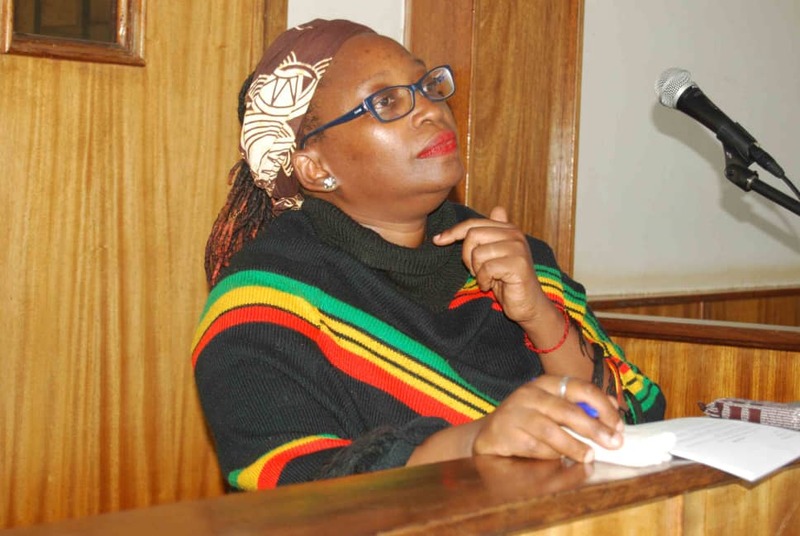 However, Nyanzi explained to the court that she is not interested in applying for bail and rather stays in prison to teach other women to write on Facebook. Nyanzi also wondered when the prosecutor Jane Kitimbo told court that police is still investigating the matter when the alleged obscene words that offended the president are clearly written on her official Facebook page. She has now been taken back on remand until the 22nd /November but court has ordered police to expedite its investigations and have her quickly tried . Prosecution first tendered in court an amended charge sheet detailing more particulars of the offenses and removing the name “Kokundeka”. Prosecution states that on September 16,2018 at Kampala District or thereabout used a computer to post on her Facebook page “Stella Nyanzi” wherein she made suggestions or proposals among others that she wished his excellency Yowerio Kaguta Museveni’s mother Esteri’s cursed viginal canal had burnt upon his unborn feotus which suggestions or proposals are obscene lewd or indecent. Nyanzi was arrested on Friday Last week from Wandegeya police station where she had gone to seek permission and security to organise a peaceful demonstration against Makerere University’s refusal to reinstate her as a researcher following a 2 year suspension due to alleged misconduct. However, this is not the first time Dr. Nyanzi is charged before court on offenses relating to attacking the person and privacy of President Museveni. It’s should be remembered that in 2016, she was charged before Buganda Road court on similar offenses and remanded for a month at Luzira prison but was cautioned not to post further offensive messages to the first family until the final disposal of the case. However, this case has since been stayed awaiting the Constitutional Court to determine a Petition she filed challenging the compulsory subjecting of all criminal suspects to a mental examination procedure before trial. Unlike on Wednesday when Nyanzi demanded that the charges be read in her mother tongue – Luganda, today she accepted that they be read in English- the official court language.